The Caminos de Ronda is one of the great attractions of the walkers and tourists who visit the Costa Brava. It is undoubtedly a practical and active way of getting to know the entire coast of northern Catalonia. From Can Poch we propose 3 routes, that by proximity to the accommodation and by indisputable beauty will be a good way to disconnect and enjoy the maximum of your stay. Leaving from the town of Sant Feliu de Guíxols and bordering the coast, we go through Molí cove, Maset cove and Sant Pol beach. Next we find S’Agaró , which was converted into a promenade planned and designed by the architect Rafel Masó in 1916. The route continues towards the beach of Sa Conca and then, surrounding the mouth of the river Ridaura, we arrive at the town of Playa de Aro. We cross this town along the promenade and go towards Sant Antoni de Calonge. The next stretch is spectacular as the Coastal Route becomes a narrow path that winds between cliffs, crystalline water coves and thick sand beaches. The stretch from Calonge to Palamós runs along a pleasant promenade along the beach. The total distance is 17.4 km. Starting from Palamós and after crossing Margarita Creek we climb to the top of cap Gros. The views from this point are excellent. once we’ve passed cap Gros, we arrive to the Fosca beach, where the ruins of the castle of Sant Esteve are. From this point, it begins the most wild part of the Costal Route. 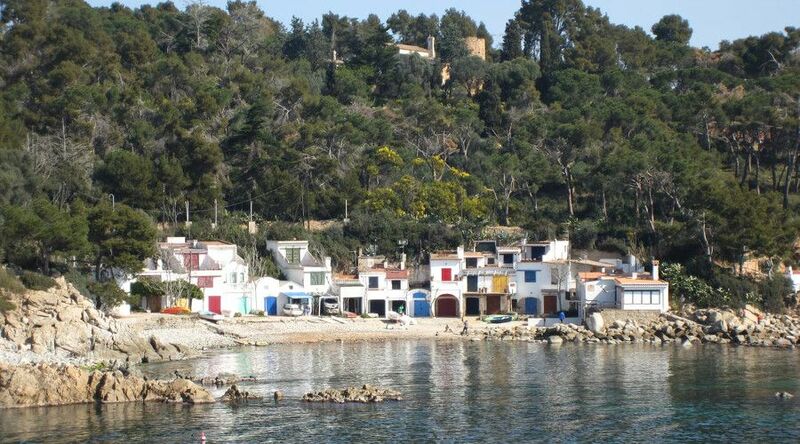 We pass through s’Alguer, a small fishermen town, a traditional Mediterranean architecture; the beach of Castell, one of the only virgin beaches of the Costa Brava; creek Canyers; Corve’s cove; Estreta creek; cap of Planes and Crit creek. Then we go up to Cap Roig, once crossed Cap Roig we get to the Golfet beach, and without noticing it we’ll arrive to Calella de Palafrugell. From here we continue to Llafranc. In total, the distance covered is 13.1km. The walk begins in Llafranc and after a steep rise, we arrive at the San Sebastián mountain, where the most powerful lighthouse of the peninsula is, a hermitage, a watchtower of medieval origin and the remains of an Iberian village. From this point, the cliff’s foot, known as the Romaboira jump, the views of the coast are breathtaking. We go down a path towards Cala Pedrosa and then we surround the cliffs in Tamariu’s direction. From this town we will go through narrow paths, which pass through the forest, arriving to the Aiguablava’s beach, port of ”ses Orats” and ”Fornells”. Finally, after a strong and steady climb, we will reach the town of Begur. We warned, this stretch is the hardest, and requires some physical preparation. In total, we will have done 12.5 km, but with a difference of 655m feet.